IRVING, Texas, Mon., July 2, 2018 – Envoy Air Inc., a wholly owned subsidiary of American Airlines Group, is expanding its industry-leading Pilot Cadet Program to assist the most promising future pilots in making a smooth transition from the classroom to the cockpit. Combined with Envoy’s seniority-based flow through to American Airlines, the Envoy Cadet Program provides unmatched advancement opportunities. At an event held at Phoenix, Arizona, Envoy and ATP Flight School representatives signed the Envoy Cadet Program agreement and welcomed ATP as an official Envoy Cadet partner. After nine months of training, ATP graduates are guaranteed a flight instructor position, allowing them to efficiently gain the experience necessary to meet airline pilot hiring minimums. 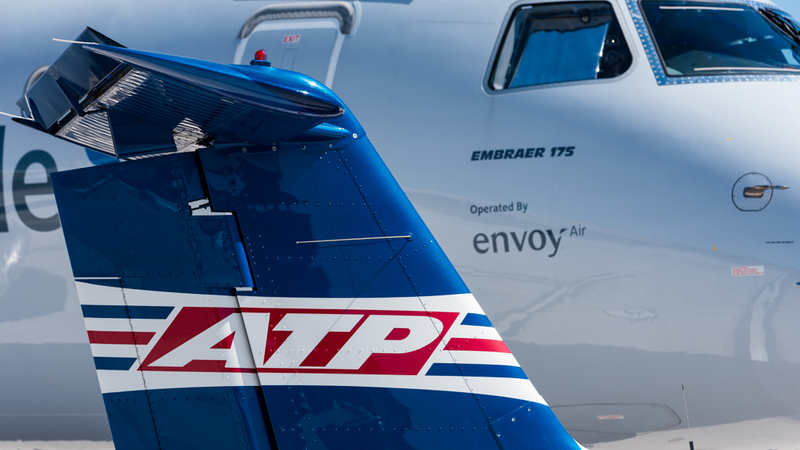 By joining the Envoy Cadet Program, ATP instructors will have the opportunity to work for Envoy, with access to travel benefits, health insurance, retirement and profit sharing plans. After transitioning from ATP instructor to Envoy First Officer, these professional pilots are on a proven track to achieve their career goals and have the competitive advantage of Envoy's rapid upgrade time of about two years and, with flow-through in just over six years which provides a direct path to a flying career with American Airlines. "We are excited to partner with Envoy and offer our students and instructors the opportunity to participate in the Envoy Cadet Program," said Danielle Calnin, ATP's Director of Airline Business Development. "ATP is known for providing students with the most efficient path to successful airline careers and leveraging this advantage with the Envoy Cadet Program provides pilots with enhanced benefits, greater quality of life, and the industry's fastest path to a rewarding career with American Airlines." The Envoy Cadet Program offers various levels of support as the Cadet’s certifications, training and experience evolves. Career mentoring by experienced Envoy Air pilots and a more personalized interview experience will begin upon completion of the private pilot license. “We’re delighted to formally welcome ATP Flight School to Envoy’s Cadet Program,” said John Dixon, Vice President of Crew Planning. “This is a great opportunity for students that want to quickly pursue a career as a pilot and for Envoy, as we gain access to some of the nation’s top aviation talent,” added Dixon. Cadets meeting the flight experience requirements for an Airline Transport Pilot (ATP) certificate will be placed into an FAA-approved ATP Certification Training Program (ATP-CTP) sponsored by Envoy. Following successful completion of the course, they can quickly start their First Officer New Hire training class at Envoy. New hire pilots with no previous airline experience are projected to upgrade to Envoy Captain with no additional interview required. Nearly 60 percent of American’s new hires since 2013 came from Envoy. With crew bases co-located in American’s largest hubs of Dallas/Fort Worth, Chicago, New York and Miami, Envoy pilots enjoy ease of commuting and worldwide travel.